I watched the Tsubasa show pretty recently (Or it feels recent anyway) and it was an enjoyable watch. It was a great adaption of the manga and I dare say that it was more interesting except for the fact that it didn’t cover the second half of the series. The half of the series where the action really kicked into high gear and the part where I became a fan of the series. Well, this OVA covers the Kamui arc, which was my favorite volume of the series. It helps that this is the first part of the story where I really began to enjoy the series. Let’s see if it has the same effect on the animated adaption! The OVA is three episodes long so it’s actually still shorter than your average theater film and it may be a little longer than your average animated film. This story takes place immediately after the library battle so the filler from the TV show has been ignored for the sake of the canon plot. The heroes arrive in a land where it is always raining acid and the world’s inhabitants have all been destroyed except for a handful of people. They have divided into two groups who protect their supply of water as they try to survive. Both groups don’t like each other and the heroes bump into a group that’s led by a vampire named Kamui. Syaoran needs to find the feather that is in this island, but what if it means extinction for the poor inhabitants of the city? Meanwhile, the Syaoran who has been trapped in the water tomb finally awakens and Sakura has to go on a solo adventure. A lot of things definitely happen in this OVA so hopefully you are prepared for a fast paced journey. Right away, you’ll likely be able to tell that the animation is much different from the show and the tone has shifted as well. This one is a lot darker and it’ll be tough for you to locate any cheerful moments. (Whereas the anime had those in spades) Of course, we do get plenty of action scenes, which is always a solid consolation prize! The soundtrack is pretty good and you should recognize most of the tunes from the anime. My favorite opera theme only appears once, but that’ll have to do. The rest of the themes are pretty good and while Tsubasa doesn’t end up having anything that will become iconic, the overall soundtrack is well above average. The theme song is intriguing since nothing really happens and we just see a glowing object. I think it works really well for a theatrical experience since it would slowly build up the hype for you. It definitely would have been more fun to look at if there were fights and fun images in the song, but this was still pretty good. For me, it’s a natural hype builder. The animation is solid and I supposed it’ll be based on your personal preferences on whether you think it beats the show’s animation or not. I think the animation here is more fluid, but the fight scenes may have been a little hurt by this. It’s hard to describe, but the action scenes aren’t really fleshed out as much as they could be. The characters are fighting and yet, not much is happening. Either the screen will cut away or they’ll only have time for a few blows to be exchanged. (The next OVA is better in this area) This OVA really only has two fights. Kamui vs Syaoran and Syaoran vs Syaoran. Both fights are very short though, which could also be why I wasn’t very impressed with them. Good action scenes take time and the OVA covered so much that they breezed through them. Sakura fights with giant monsters, but I can’t say that it’s much of a consolation prize this time. Syaoran is the protagonist that we all remember, but his personality quickly changes as the OVA goes on. He starts out as the happy camper that we’ve come to expect and by the end you can only call him a hero who has strayed from the path and turned into the villain. He wants to get the feathers at any cost and that cost may now include murder. (Of course, he did risk the lives of everyone in the village to get a feather in the TV show so…) One can argue that the change is beyond his control since a soul is taken from him, but he still has his soul so I like to think that he can control it. He still has his memories and everything so this was basically his decision. It’s intriguing, but I would say that he is my favorite villain in the series. He gets a pretty huge power up to coincide with the trope that a hero who turns evil gains great power. The mysterious Syaoran in the container wakes up and he gets a role in this OVA. He uses a mixture of sword techniques and thunder abilities to contrast with the other Syaoran’s fire sword and spellcasting. 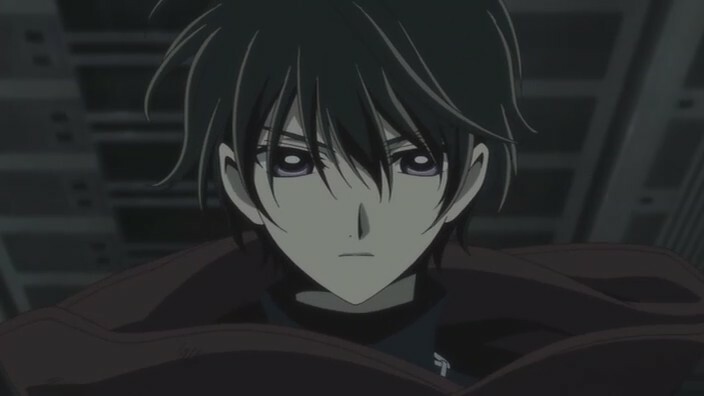 He is similar to the original Syaoran, but he’s definitely more sullen. He’s not very cheerful and his thoughts always seem to keep him preoccupied. His arrival brought many questions along with it and it’ll be tough for the other heroes to get used to him being around. Which Syaoran is to be trusted right? All is explained in the OVA and they’ll continue to bring up more plot points as Tsubasa goes on. Kurogane is really more of a non factor here. He proves that he can go up against Kamui in a fight and he’s definitely a skilled warrior, but he doesn’t really have a stake in the whole situation. He does get a lot of character development with Fai though since they have definitely become closer as allies. Fai still keeps his secrets, but it doesn’t stop Kurogane from making a dangerous decision to save his life. It’s also frustrating for Kurogane since he’s unable to help when the two Syaorans face off against each other. It wasn’t a great moment for him, but I’m sure that he’ll do better in future stories. He’s still a pretty good supporting character and he just needs a good power up to keep him in the helpful section of characters. Fai doesn’t look very good in this OVA. He has a lot of power and he’s finally willing to use it to help the others, but he underestimates his opponent. This is a critical mistake and he ends up losing just about all of his power. He went from being immeasurably skilled to suddenly being the weakest member on the squad. Kurogane makes a deal to keep Fai alive, which also gives Fai some superhuman abilities, but it’s regrettable that the situation had to occur at all. I would have expected Fai to have put up a better fight. I definitely didn’t care for him in this collection, but I’m sure that he’ll do better in the next OVA. He just needs to learn how to fight in his new state and he’ll be set. Sakura is mostly asleep or unconscious in this OVA due to circumstances that happened earlier. All of the clone drama and other twists have likely weakened her condition as well. She is unable to prevent the tragedy of the two Syaorans fighting and when she finally wakes up once again, Sakura is given a task. She must find a treasure and bring it back to the base so Yuko can grant a wish to help the heroes. This results in Sakura going on her own adventure to get past giant monsters and prove that she can help the team as well! It’s a noble gesture and Sakura is a good character although it would be great if she was conscious more often. Going on the trek by herself did grant the other heroes some much needed rest so it certainly helped. Kamui quickly became one of my favorite characters in the manga so it was nice to see him appear in the OVA. He’s still one of the better characters although he may not be quite as high for me here as he originally was in the manga. He was just a little weaker than I remembered since he looks bad against the other squad of humans and his showing against Kurogane wasn’t great. He still pulls through when it counts, but Kamui wasn’t quite as awe inspiring as I had remembered. Still, his design is pretty good and he’s one of the few vampires that I actually like. Kamui is also pretty unreasonable to the other group. They just want to share resources to last longer in this world, but Kamui just wants to fight. Perhaps they did something in their series to make Kamui distrust them, but strictly speaking from a Tsubasa viewpoint, Kamui and his team seemed to be at fault. Kamui’s twin, Subaru, isn’t quite as memorable since he doesn’t really get to appear until the very end. He spends most of his time being trapped, which doesn’t help his case. This OVA definitely takes place at an interesting time since there is really no conclusion. The animators likely should have just made this a 13 episode OVA to adapt everything since there isn’t a whole lot of time in 3 episodes. Still, it was good to see that Tsubasa’s popularity was still strong enough to get it this far. Viewers of the show may not appreciate how different the OVA is from the show, but this also occurred in the manga. The OVA isn’t very violent although one character does steal someone’s eye, which is definitely the most graphic part here. I never liked that kind of violence since attacks against the eye are rather sensitive. It’s just not the same as losing an arm or something like that. Still, it’s not very graphic and it’s just the thought that can be stomach churning. The OVA is certainly a lot more intense than the show, but likely nothing that you can’t handle if you’ve seen Naruto Shippuden or Bleach. The only other scene that may not be a lot of fun is the Sakura vs Giant Monster part. She has a gun so you can likely tell that the monsters are doomed. That part’s a little iffy since giant monsters are practically the same as animals at times so those scenes would be a little negative as well. 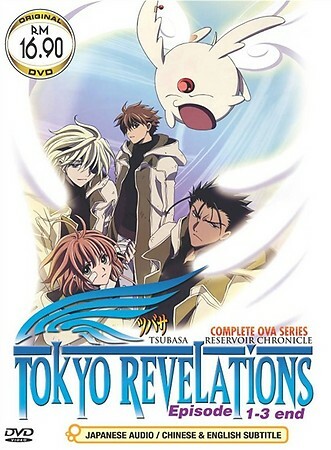 This entry was posted in 7 Star TV Shows, Reviews, TV Show Reviews, TV Shows and tagged Anime, Anime Review, Clamp, Kamui, OVA Review, Review, Sakura, Syaoran, Tsubasa, Tsubasa Tokyo Revelations by dreager1. Bookmark the permalink.